DALLAS – National labor and employment law firm Constangy welcomes attorney Arthur V. Lambert to its Dallas office as partner in the firm’s litigation practice. Constangy has experienced tremendous expansion since 2010, with more than 30% total growth and seven new offices. Lambert concentrates his practice in labor and employment law, with an emphasis on litigation. His practice also includes work in non-competition and trade secrets, whistle blowing, professional negligence, class actions and injunction proceedings. His seasoned experience in litigating matters of sexual harassment, discrimination, wrongful termination, and wage and hour disputes before federal and state courts, administrative agencies, and arbitration tribunals continue to be instrumental in helping clients successfully navigate employment law challenges and maintain sound compliance. Prior to joining Constangy, Lambert was the head of the Labor and Employment practice group at a Texas-based firm, where he routinely counseled employers on issues including hiring, firing, FMLA, disciplinary policies, accommodation and compensation matters. He has been a board-certified member of the Texas Board of Legal Specialization in the area of Labor and Employment Law since 1998. A graduate of the University of Virginia School of Law, Lambert received his undergraduate degree from the State University of New York at Stony Brook. Lambert has been ranked multiple times by Chambers USA in the employment law category. He has been recognized by Texas Super Lawyers and Texas Monthly magazine six years consecutively. Additionally, Arthur has been selected as Park Cities YMCA Father of the Year and has been published in several legal and business publications including Best’s Review,Insurance Journal, the Dallas Business Journal, Houston Business Journal, Dallas Bar Headnotes, Texas Lawyer and Lawyers USA. Constangy has counseled employers on labor and employment law matters, exclusively, since 1946. A “Go To” Law Firm in Corporate Counsel and Fortune Magazine, it represents Fortune 500 corporations and small companies across the country. 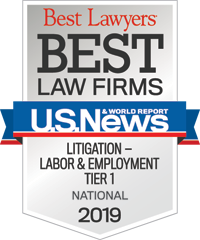 Its attorneys are consistently rated as top lawyers in their practice areas by sources such as Chambers USA, Martindale-Hubbell, and Top One Hundred Labor Attorneys in the United States, and the firm is ranked as a Tier 1 firm by the U.S. News & World Report/Best Lawyers Best Law Firms survey. More than 140 lawyers partner with clients to provide cost-effective legal services and sound preventive advice to enhance the employer-employee relationship. Offices are located in Alabama, California, Florida, Georgia, Illinois, Massachusetts, Missouri, New Jersey, North Carolina, South Carolina, Tennessee, Texas, Virginia and Wisconsin. For more information, visit www.constangy.com, or download our app for iPhone/iPad.